NEW YORK (CNS) — The fact-based drama “Miracles From Heaven” (Columbia) tells a remarkable story. Though director Patricia Riggen’s screen version of Christy Beam’s 2015 memoir is clearly designed for believers — and sometimes feels padded — even dedicated skeptics may have trouble dismissing its underlying narrative. A wife and the mother of three daughters, Christy (Jennifer Garner) is going about her everyday life in the Fort Worth area of Texas when tragedy strikes without warning: Her 10-year-old middle daughter Annabel (Kylie Rogers) develops an unexplained but seemingly unshakable illness. Alarmed, Christy refuses to accept the series of more or less casually delivered misdiagnoses from unfocused doctors with which she’s presented. And eventually, the grim truth emerges. Annabel’s symptoms are identified as stemming from pediatric chronic intestinal pseudo-obstruction, or CIPO, a rare, painful and incurable condition that prevents the body from digesting food. Persistent Christy now focuses on obtaining the care of one of the few specialists in CIPO, Dr. Samuel Nurko (Eugenio Derbez). However, although kindly and caring, Dr. Nurko proves powerless to combat the disease — and Annabel’s death sentence stands. Although Christy and her easygoing veterinarian husband, Kevin (Martin Henderson), are dedicated churchgoers — John Carroll Lynch plays their good-humored pastor — Christy’s faith crumbles in the face of Annabel’s current torment and impending demise. She finds herself unable to pray. She’s also deeply angered by the misguided notions of some fellow parishioners who seem to entertain a pre-Christian understanding of the connection between sin and misfortune. Yet a startling, almost inexplicable, turnaround awaits Christy — one which is certainly providential if not indeed miraculous. Though it may be aimed at a self-selecting audience of the already convinced, screenwriter Randy Brown’s script minimizes neither its protagonist’s crisis of doubt nor the larger mystery of innocent suffering. The dialogue also takes a wide view of what counts as a divinely inspired marvel, highlighting the above-and-beyond kindness shown to Christy and her clan by an ensemble of secondary characters. 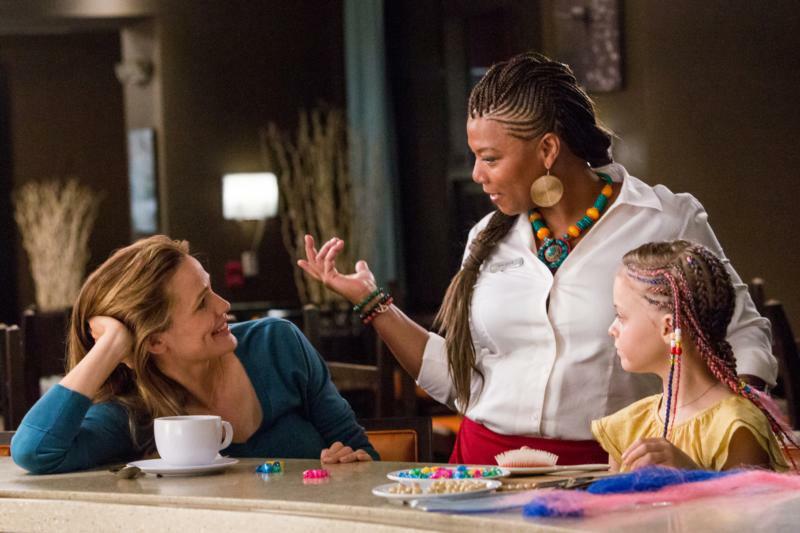 The most significant of these is Angela (Queen Latifah), a gregarious waitress who takes an instant — and cheering — shine to Annabel. While squeaky clean as far as the normal array of objectionable elements is concerned, “Miracles From Heaven” nonetheless includes both subjects and sights that make it inappropriate for the youngest viewers. The film contains mature themes as well as potentially upsetting incidents and medical procedures. The Catholic News Service classification is A-II — adults and adolescents. The Motion Picture Association of America rating is PG — parental guidance suggested. Some material may not be suitable for children.